When my dad, Robert, was born in 1952 the average home in the UK cost £1,891. Eight years later, when he was getting up at 4am to help out the milkman on his rounds, house prices had risen 22% to stand at £2,301. By the end of the Sixties, whilst men were landing on the moon, my dad was busy passing his driving test so he could take over the milk float duties and take on a round of his own. It would’ve taken a lot of bottle caps to buy a home by then - with the average UK property now costing £4,312. A pint of milk at the time cost 10d (5 pence)! By the time he married my mum in 1974 he was saving hard for the deposit for their first home. They bought a three bedroom semi-detached house in Oxford in 1976 for £12,250. That figure was only slightly above the average house price for the country at the time. That’s quite amazing considering Oxford is now dubbed the “least affordable place in the UK”, with the average home costing 10.7 times the local salary. In 1979 his first daughter was born. Whilst my dad watched my mum change her nappies, the average home in the UK cost £21,966, having roared ahead 402% throughout the Seventies. In 1982 my other sister came along, followed by me a couple of years later. In the five year gap between my parents' three children the UK had seen average property prices increase a further 42%. In 1985 we moved to Surrey. At the time the average house price in Surrey was £87,524 but prices since then have increased 411% (it’s taken 30 years to increase a similar amount as property prices managed in the Seventies alone). Continuing to work his way up the corporate ladder, at the start of the millennium my dad took a stake in the business he had helped develop. 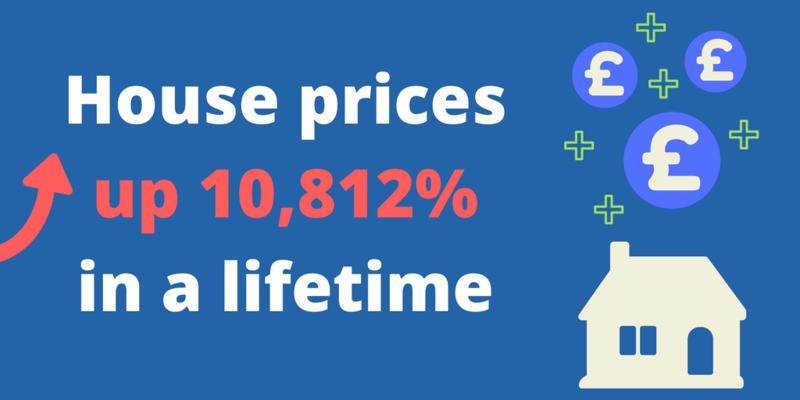 At this point the average property in the UK cost £77,698. My dad retired in 2007, just before the credit crunch kicked off and as house prices temporarily peaked at £184,131 (a rise of 137% in seven years). Having sold his business and with house prices starting to drop (they eventually did so by 18.7%), my dad provided me with the impetus and funding to start my own property portfolio. The average property price in the UK today has since recovered and exceeded the previous peak by some 12% to stand at £206,346. This completes the 10,812% rise from the £1,891 figure when my dad was born. Clive Robert Janes, CRJ Lettings.